Well, those of you who are regular here know this has been a hectic month for me. The sad news is that the Kickstarter to get Citizens off the ground was unsuccessful. I’ll talk about that some when I wrap up the whole Kickstarter blog entries. But—if you really know me you know that not all hope is lost. In fact, I talk with the uber-talented Joe Badon (artist for Citizens, if you weren’t paying attention) this coming weekend about what our next move is. I definitely want to see it happen, but as a writer in a very visual medium, much of it will depend on Joe’s interest level. I’ll have more to say about that next week. 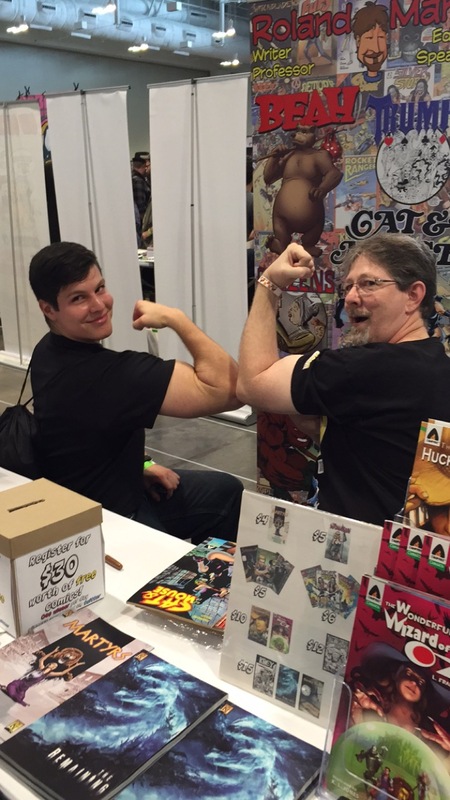 New Cat & Mouse reader Billy and I compare guns! 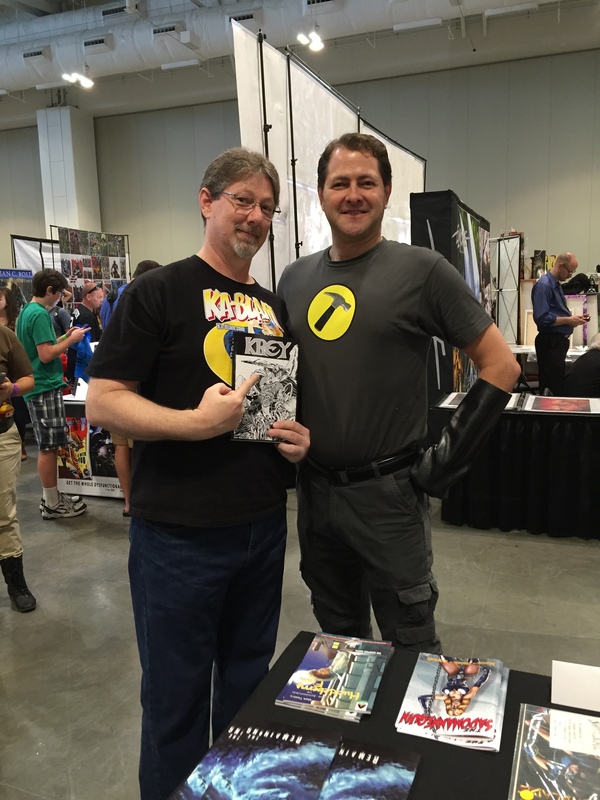 Captain Hammer approves of Krey! 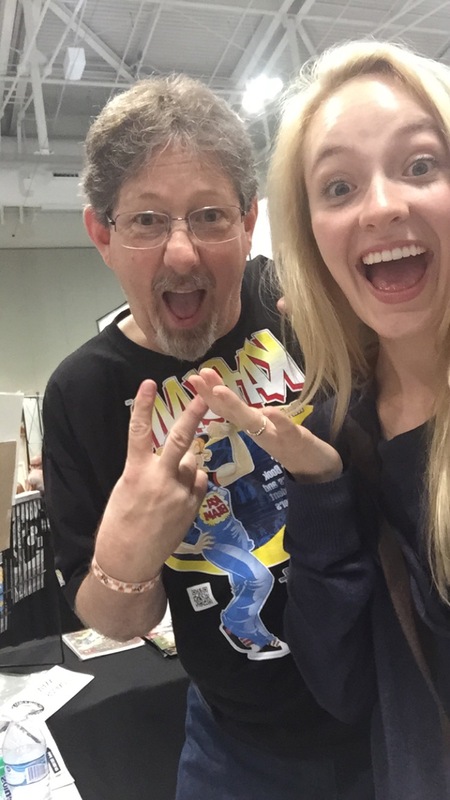 I had a great time at Wizard World in Nashville last weekend. Daughter Brittany was able to attend with me and we were hosted by the very gracious Kyle Saylors, who was wrapped up in a music video shoot when we arrived. Kinda cool! I got to see some old pals: chatted with Howard Chaykin and picked up almost like it was just a few months since I’d last seen him. Danny Fingeroth invited me to participate in a few panels—and much fun was had. Got to see Ronnie Prudhomme, who was about 16 the first time I ever met him: wish I could dig up the picture of me, Steven Butler, Mitch Byrd and Thomas Florimonte at his dad’s store: Paper Gold. Books by Sara Woolley and Myke! 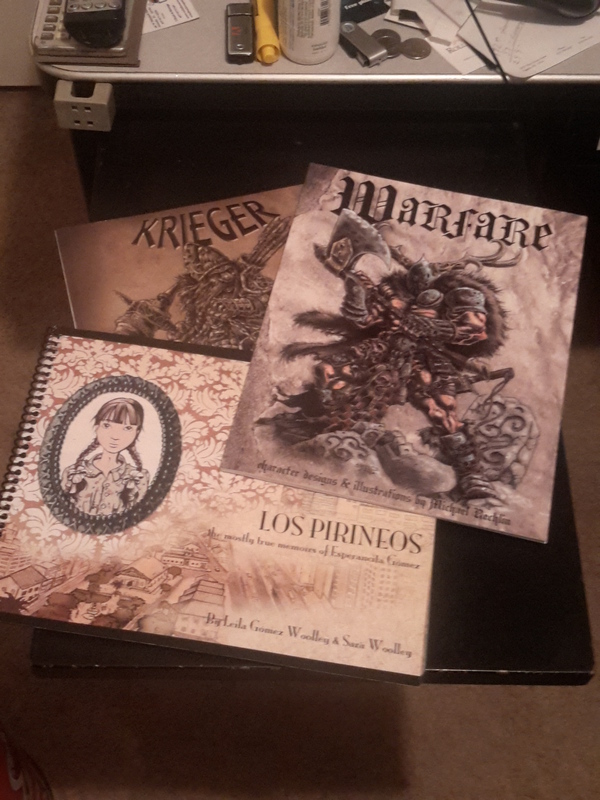 I also got to meet some new folks: I was able to pick up some cool swag from Sara Woolley and Myke! (see the pic) Sara was my neighbor in Artists Alley and we were on one panel together (Writing Comics). And, of course, it wouldn’t be a comic convention without some cool cosplay folks. You should note they proudly support my work—so you should, too! Batfan Spiderman is fan of Roland Mann! Well, I had a blog all ready to go, but two events the last couple of days caused me to write this instead. The two events are unrelated, but combined just make for one bummer of a few days. The first, and lesser, event is that my apartment was burglarized (or burgled—because I like that form of the word). They didn’t get much because I don’t really have much IN my apartment—it’s very barebones while we still wait to sell the house (prayers on that end are MUCH appreciated). Still, they broke the window and took our PlayStation (with a game in the drive) and they handpicked ONE singled DVD—left the others there (about a dozen)! I’m thankful, but I can’t figure out why they didn’t just take them all or why they picked the old 1940s Batman serials over Green Lantern. It isn’t so much the missing items as it is the feeling that someone waltzed into my home and took stuff that I worked (or BJ did) hard to earn money so I could pay for it. Quite simply, it makes me angry and I just want to smack them in the face! The other downer is that I learned of the death of a friend. Terry Wagers owned Hub City Comics in Hattiesburg, MS., in the late 80s and early 90s and was incredibly supportive of me in my early writing career. In fact, it was Terry who sponsored the very first autograph session for me, Mitch Byrd and Steven Butler when Cat & Mouse was released in 1989 (see attached picture with the three of us and Terry). I don’t know exactly how many copies he ordered, but it was a BUNCH! He wasn’t only a vocal supporter mine, but of all the local comic talent in the Hattiesburg area, and he was a financial supporter, too, ordering plenty of our work to stock his shelves and make it available to anyone who happened by–and I always tried to direct people to his shop to buy my work. Sometime in the early 90s, me, Terry, Steven and Mitch all trekked over to the Dallas Fantasy Fair. Mitch carried a big touristy camera around his neck taking pictures of all the architecture–he must have taken close to 100 pictures, and this back in the day of film! The four of us crashed in the hotel room and talked non-stop geek-stuff on the 10 hour drive there…and back! We were all packed in to Terry’s little Japanese car (Camry? )…and Terry wasn’t exactly a small guy to begin with. I still have hours of video footage from this trip! Once I married and moved away, we dropped out of all but irregular contact. Then, he closed the shop and I didn’t hear from him for several years. It wasn’t until recently that I got the friend request from him on Facebook and discovered his battle with cancer. Unfortunately, he lost that battle. RIP my friend Terry. Hope you’ve got a bunch of cool comics to read. You are missed. Those who’ve known me for more’n a decade know that I’ve been to dozens and dozens of comic book/science fiction (recently turned media) conventions. I first began going as a fan and not long after, as a “guest.” Most of the shows I’ve been to have been in God’s country down here in the Southland: Dallas Fantasy Festival, Atlanta DragonCon, MegaCon (Orlando), NOSFF (New Orleans), CoastCon (Biloxi), MobiCon (Mobile), ChimneyCon and MissCon (Jackson), MidSouthCon and ShadowCon(Memphis), Chicago ComicCon, WonderCon (Oakland), SPE (Small Press Expo), APE (Alternative Press Expo), and a couple I’m sure I’ve forgotten. Most of those named I’ve been to multiple times, CoastCon probably being my most attended show (and the FIRST to ever invite me as a guest). One of my personal highlights for the show was getting able to visit with and see old pals (picture: left to right: Steven Butler, yours truly, Ken Branch, Dan Nakrosis, Mitch Byrd). Wizard even worked it out so that our tables were positioned immediately next to us. Talk about convenience for our fans! The neat thing was that it’d been 20 years since me, Mitch and Steven had signed copies together and never before had me, Mitch, Steven and Ken ever been in the same place at the same time. Neither here nor there, I guess, still, it was pretty cool. Ken is pushing his hot off the press graphic novel, 35 Years Will You Survive?, a story of global warming repercussions. I also had the opportunity to visit with Christy Butler, Steven’s wife. I think Christy is a lot like BJ (my wife—for those one or two who didn’t know) in that a little bit of “conventioning” is enough. I tell the story of BJ’s first trip to the San Diego Comic Con, the granddaddy of them all and how she showed up at the Malibu booth and said she was going to look around. Fifteen minutes later she was back and saying goodbye—she’d seen enough of the convention to suit her fancy. And she went shopping in downtown. 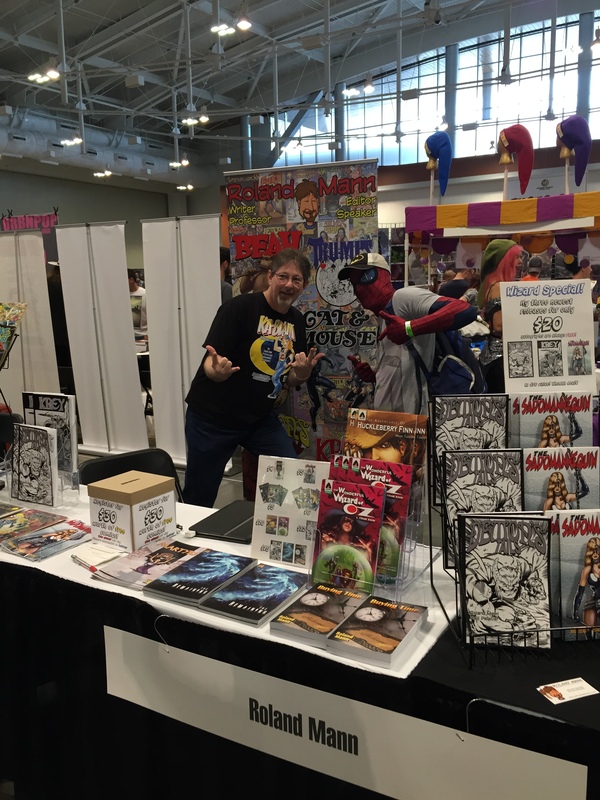 I’ll eagerly do another Wizard World Comic show…and you should check out one in your area!